Did you know that people are selling gold scrap on eBay? We were surprised when we found out that you can. Just enter the term “gold scrap” in the eBay search window. A lot of items will come up that you can either bid on or buy on the spot. Karat gold scrap, or just scrap? When it comes to buying gold scrap on eBay, Caveat Emptor! Small items of jewelry like chains, pins, earrings and broken little chunks of this and that. Some of this stuff is made up of mixed lots of items that purport to be karat gold, gold-plated items, gold-toned items, what have you. Electronic items like old computer chips and circuit boards. Weird items that you will want to boil, like gold teeth old dental appliances. Even weirder items, like gold-toned ceramics that are being sold with the questionable claim that they contain gold that can be profitably recycled. Nuggets and powder that is said to contain gold. It’s interesting to notice that gold bullion and coins tend not to show up when you search for “gold scrap.” That’s probably because bullion and coins have firm values; if you own them, you can take them to a dealer and, if they are genuine, know exactly how much money you will get for them. The “gold scrap” that turns up on eBay, in contrast, tends to have questionable, hard-to-determine values. As a buyer, you are supposed to read the descriptions and buy on the expectation that the items you are getting are worth a lot more than what you are paying. You’re supposed to believe, for example, that you are getting $100 worth of gold when you spent $25 for a small stack of old computer CPUs. Which leads us to this important question . . .
Why would anybody sell gold items on eBay for less money than they are worth? It just doesn’t make any sense, does it? Would you do it? If you owned an old 18k gold charm that is worth $150.00, for example, why would you decide one day to sell it on eBay for $50.00? And do you know what? The people who sell gold scrap on eBay don’t throw money away either. They are hoping to sell you maybe $10.00 worth of stuff for $50.00, $75.00 or more. That’s how they make money. All that glitters could only be gold plate – The pictures of scrap that’s for sale show lots of nice shiny gold pieces. But especially in mixed lots of jewelry scraps and bits, it is almost certain that most of the pieces are cheap gold-plated or gold-tone items. They might look good, but they’re worth little. The listings appeal to gamblers – Apparently there are some gullible buyers who are willing to take a chance that there will be one 24k item hidden in a jumble of jewelry bits and pieces, or that $250.00 worth of gold can be extracted from a $20.00 stack of circuit boards. Sellers are hoping to find buyers like those. And again, sellers are going to go through everything they’re offering to make sure not to include items that are worth more than their selling prices. Sellers are keeping the details in their descriptions hazy – For example, one batch of gold scrap that’s for sale on eBay today is described this way: “Vintage antique 145-gram gold filled lot. Included gold filled and 12k, 14k items. Wear, repair, harvest. Starting bid .99 cents.” Note the use of the words “vintage” and “antique” and the reference to “12k, 14k items.” The seller is withholding specifics and appealing to emotions. No matter where you find gold scrap – with your metal detector or in the bottom of old dresser drawers or at estate sales – buy it yourself, not from online sellers who have already picked over everything and kept any items that have genuine value. 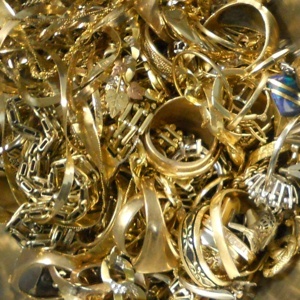 When you find gold items that you think could be valuable, give us a call at 800-426-2344 and speak with one of our precious metals recycling consultants. We’ll test your items for you – we may even pay your shipping costs – and let you know how much your gold is worth. If you learn that your little items of gold scrap aren’t worth much of anything, you can always sell them on eBay and hope to make some money, right? No, you wouldn’t do that. So…why would you buy from online sellers who are hoping to sell virtually worthless scrap to you?